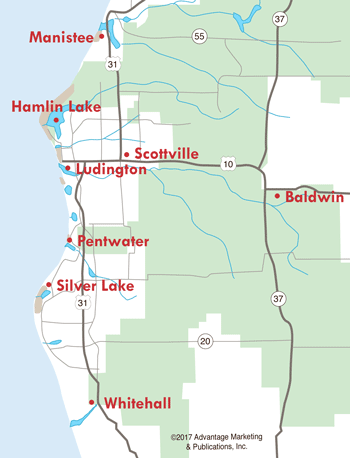 Summertime means arts and crafts fairs, and communities in Oceana County have several of these scheduled, often in conjunction with their annual festivals. Many talented people from near and far offer their wares for sale in the beautiful outdoor settings which occur throughout Oceana County. Here you can find many unique handcrafted and artistic items for your own home or for gift-giving. Here's a list of the summer arts and crafts fairs that usually occur. Dates for 2019 are being listed as they become available. 7-8 - National Asparagus Festival Arts & Crafts Fair, Friday 10am-6pm, Saturday 9am-5pm, courthouse lawn, Hart. 15-16 - Pentwater Spring Fest Arts, Crafts and Antiques, Saturday 10am-5pm; Sunday 10am-3pm, Pentwater Village Green. For application information, click here . 13 - Pentwater Junior Women's Club Fine Art Fair, 9am-5pm, Pentwater Village Green. For application information, click here . 20 - Mears Arts and Crafts Fair, 9am-4pm, Johnson Square Park, Mears. - Ramp Up the Arts, 1pm-4pm, The Ramp Gallery, Hancock Building, 215 N. Hancock St., Pentwater. 13 - Farm Fresh Apples and Craft Show, Silver Lake BBQ Festival, Friday 3pm-8pm & Saturday 10am-5pm, Silver Lake. 28-29- Pentwater Fall Festival Arts and Crafts Fair, Saturday 10am-5pm; Sunday 10am-3pm, Pentwater Village Green. For application information, click here .